This particular tripletail recipe has a story behind it. On its face, what you’re looking at is butter-poached fish served with chow chow and a rich seafood broth. But it’s really Tripletail Ooh La La. OK, so my friend Joe Baya of the magazine Great Days Outdoors and I were hanging out in Mobile Bay, Alabama, catching tripletail. Tripletail, if you’re not familiar, are kinda like a gigantic, saltwater version of a crappie. I managed to catch myself a real nice 15-pounder. A fish of that size needs to be treated like the trophy it is. How to cook it? 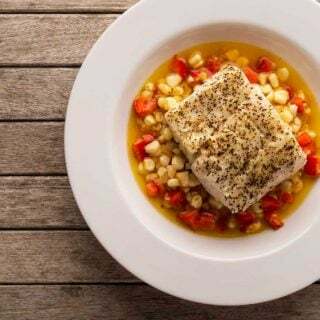 Tripletail is a mild, firm, white fish with a texture very much like grouper or striped bass, which is to say slightly chewy and unusually savory. Everyone I know says it’d be a crying shame to just batter and fry it. Normally I sear tripletail and serve it over grits. Instead, with a laugh, Joe suggested I make Tripletail Ooh La La. What the heck is that? It’s a Baya family joke. This then became the running joke of the trip. Every time a meal came up, and Joe and I were deciding on what to make, someone would suggest [insert protein here] Ooh La La. So here it is. I’m planting my flag on this as the definitive Ooh La La recipe. — a seasoning apparently in just about every Alabaman’s spice cabinet — served with a Silver Queen corn chow chow and a very French saffron seafood nage made with some Silver Queen corn cobs tossed in. A nage (nah-zh) is a concentrated, flavorful broth. Don’t get all hung up on this as a tripletail recipe. You can use any fish here, really. Snapper, seabass, lingcod, redfish, tilefish, even salmon or tuna. It needs to be a fish you can get a thick block or chunk from, though. And if you can’t find Cavender’s seasoning, just use black pepper. The nage isn’t terribly hard to make, but you will need some fresh fish stock or crab stock to start. I made mine from striped bass heads and bones, but any lean fish will work. Avoid salmon or bluefish or mackerel for the stock. How does it taste? Awesome. 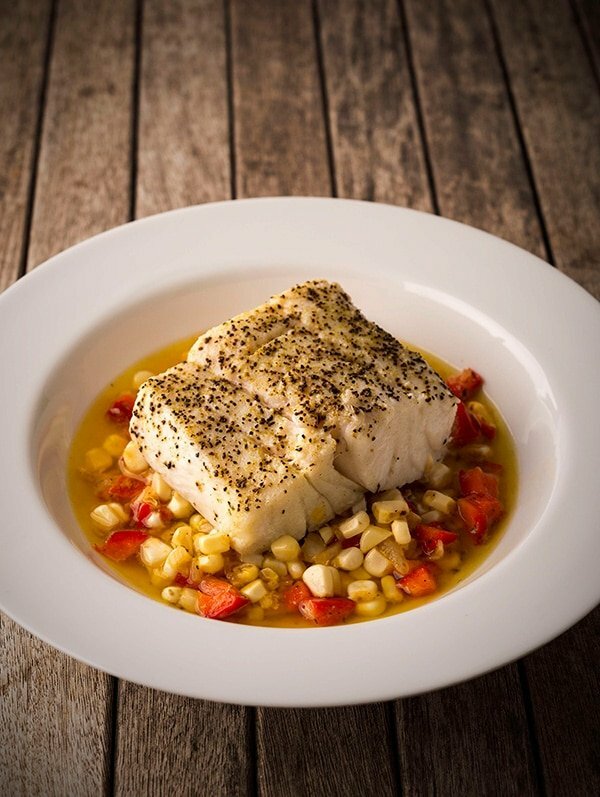 The butter poached tripletail is meaty and silky, with the Cavender’s adding a zippy accent. The chow chow is crunchy, sweet, sharp from the vinegar and mustard in it, colorful and very Southern. The nage ties it all together. It doesn’t look like much, but it has so much flavor from the fish stock, corn cobs and saffron you will want to drink a cup of any that’s left over. 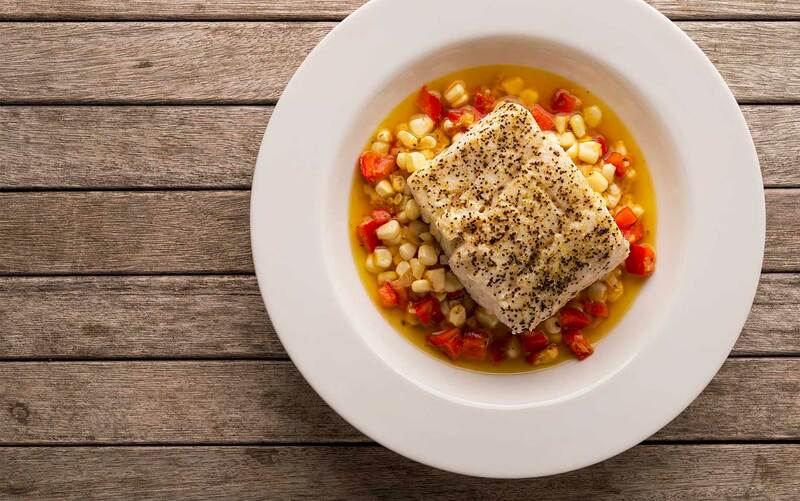 This recipe works with many kinds of fish, not just tripletail. 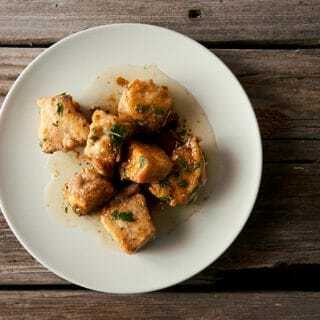 Choose a fish you can serve as a block or big thick chunk. For the butter, you need a lot, but it can be saved in the fridge and reused three or four times before it gets fishy. The chow chow and nage can be made up to three days in advance. Slice the kernels off the corn, reserving both the cobs and kernels. Make the fish stock or crab stock as per the recipe, adding in the cut up corn cobs. Strain and add 4 cups of the stock and the white wine to a new pot and simmer it down by half. Add the saffron and let steep for at least 15 minutes. While the stock is simmering, make the chow chow. In a large pan, heat everything (including the corn kernels) over medium heat for about three minutes, until warmed and well combined. Turn off the heat and leave everything in the pan. Melt the butter in a pot just large enough to hold the pieces of fish and the butter. Gently poach the fish under the melted butter for about 15 minutes. Keep this on low heat the whole time. To finish, whisk two tablespoons of butter into the nage. Give everyone some chow chow, top with a piece of fish. Sprinkle on the Cavender's. Pour a little nage around the bowls and serve. You can find more recipes for tripletail as well as lots of other fish, right here on Hunter Angler Gardener Cook!